Become the big guy from up North with this XL Deluxe Flannel Santa Suit. 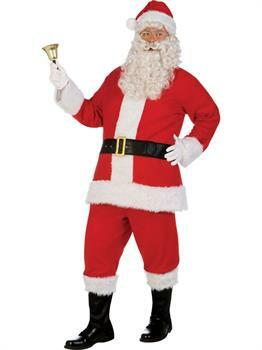 This extra large men's costume features the iconic style associated with Santa Claus. Beloved by kids all over the world, this character rewards good girls and boys with gifts every Christmas. Based in the North Pole, this jolly old soul works throughout the year to make toys, games and gadgets for kids. He gets much-needed help from his wife Mrs. Klaus, his flying reindeer and his tireless team of elves. Now you can spread some holiday cheer with this deluxe costume set. This outfit features a red flannel jacket with white trimming and furry cuffs. Additionally, this set also includes a pair of matching pants, a classic Christmas hat and a pair of black boot covers. To complete the pictured look, be sure to also include a pair of glasses, a white beard, a matching wig and gloves. You'll be yelling 'ho ho ho' in no time with this awesome x-mas suit.